Small, fine and affordable – these are the three words that come to my mind when I think of the chamois hunt in Slovenia. The Slovenia, which emerged from former Yugoslavia, has become a hotspot of chamois hunting. Its good reputation as Gamsland Slovenia has worked out on the one hand by the very good Gamsbestände and also good trophy quality, on the other hand also by prices which are partly half as expensive as in neighboring Austria. Although in some districts even the same chamois are hunted, since one side is Austrian and the other side is Slovenian, the price differences are enormous. To hunt for chamois I went to the Kokratal, which is easily accessible from Germany by car via Austria and the hunting ground is very close to the Austrian-Slovenian border. Another option would be by plane to Ljublijana and pick up from the airport or rent a car, but since I wanted to be flexible, the car was the best option. Since I and my colleague arrived at our accommodation around noon on the day of arrival, the professional hunter had offered us immediately, we could immediately go on an evening game walk and see if we can get a cham. Since we were still quite fit after the longer drive, we had agreed and at 15:00 clock it was already going on. Here in the Kokratal is hunted on the Waldgams, i. there is a lot of forest and only in the higher elevations one is at above the tree line. This makes the hunt on the one hand exciting, as everywhere can be counted on clear cuts and chasms with chamois on the other hand, this hunt also for older hunters or those who are not too good on foot, since most parts of the area over good forest roads are reachable. Thanks to the forest areas, the area offers not only chamois but also red deer and partly roe deer, so that hunting for red deer would also be possible after successful chamois hunting. Our focus is but this time only on the chamois. On the first evening we stalk various promising places and sat down the last hour to a 1-2 year old club face, but could not see any gams. The next morning after breakfast we started again. First, we climbed relatively high to another face and observed the area for about 1h. We got a few pieces of red deer and a young chamois, but not yet in the right age. Then we drove off different strokes and open spaces, but could only see 2 pieces of red deer, as well as a Geis with fawn. About noon, we went back to the pension and my colleague also told of some chamois, which he had seen with his guide, but all were still too young. After lunch and a short nap, we left in the evening. This time, my professional hunter had decided to stalk in some stony terrain which ended at a larger gorge, from where we had a very good view of the opposite side with many strong changes in the scree and a salt lick. Here we wanted to try our chance today and wait for our chats. At regular intervals, we glazed off the various changes and kept in mind the salt lick in front of everyone. Suddenly something happened and on the change came the first chamois, but again a yearling and a geis with fawn. As it was already getting darker, a cham brought in the salt lick. Immediately we reached for our binoculars to see if this would be the right one. The chamois is about 6-year-old chamois with a very good bridge, but one side was broken off, so we decided to let them go. Since she was probably the main gamen around the salt lick, we could not see any more chamois at this lair. Back at the property, my colleague told me at dinner that they had also seen some chamois, including a very old strong geese who wanted to kill them, but the wind was not on their side, so they jumped before he came to shoot , Knowing that we saw some chamois again, we went to bed to wake up early in the morning to try again. The next morning we wanted to use the time and instead of sitting to drive more in the area and stalking to be able to cover a larger area. After about 1h we saw suddenly while driving a very good Gamsbock in the blow, which my professional hunter already knew, however, was shot at this already 3 times by hunters, so he is accordingly careful. We drove on slowly and then cautiously stalked back. The buck was still there but is raised to about 380m steeply up the mountain. Unfortunately, the weather did not play in the maps, with the binoculars we could still find the goat but it was impossible, through the fog that rose now, impossible to capture the goat still in the riflescope exactly. Since we did not want to miss a shot or wound at this distance, we decided to continue searching and come back later. As we stalked back to the car we suddenly saw in one blow on the other side of the precinct 3 chamois standing underneath an older buck. After a short consideration, the decision was made to try this. 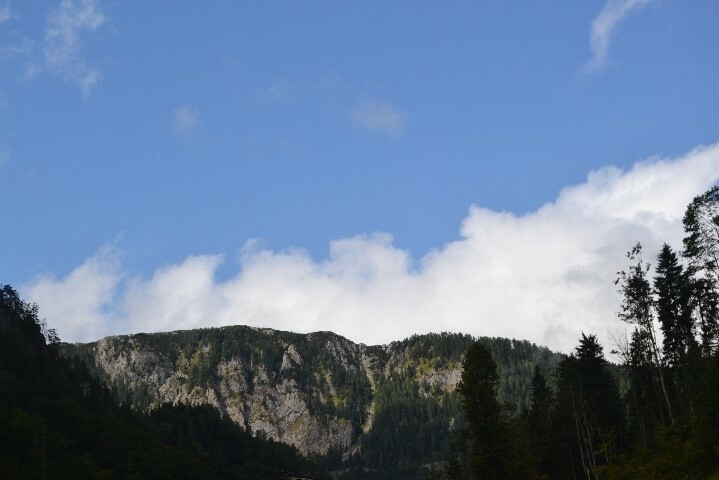 We first drove to the other side of the area to stalk from the foot of the mountain in the direction of Kahlschlag. After about 25 minutes we reached a small bottom seat from which we could see the blow, and luckily the buck was still there but at 450m and covered by bushes. We decided to stalk closer and crawl, taking advantage of any cover available to the foot of the blow. From here we had a very good view of the entire area and could respond well to the buck on 250m, but still not succumbed because he was still hidden in the bushes. Lying on my rucksack, I straightened up to await the buck as it emerged from the bushes. 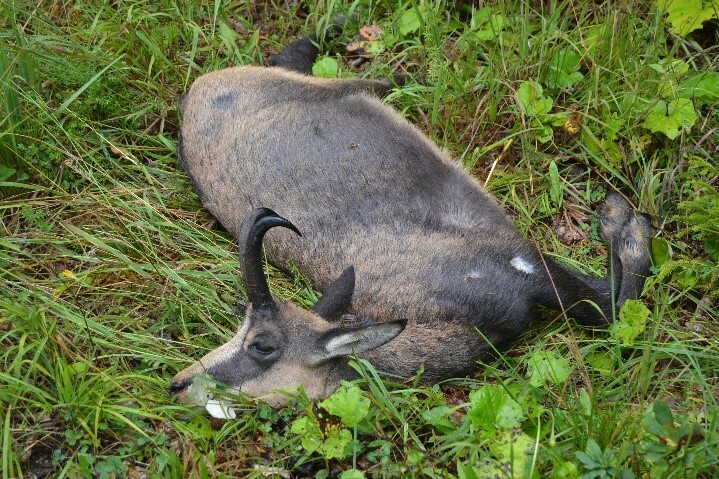 After about 15 minutes of waiting the buck did us the favor and I could kill him on 250m steeply uphill and he collapsed in the fire of the 8x68s immediately. After another very strenuous climb that went almost vertically up the mountain I finally had my coveted trophy in hand, a good buck with 90CIC points. 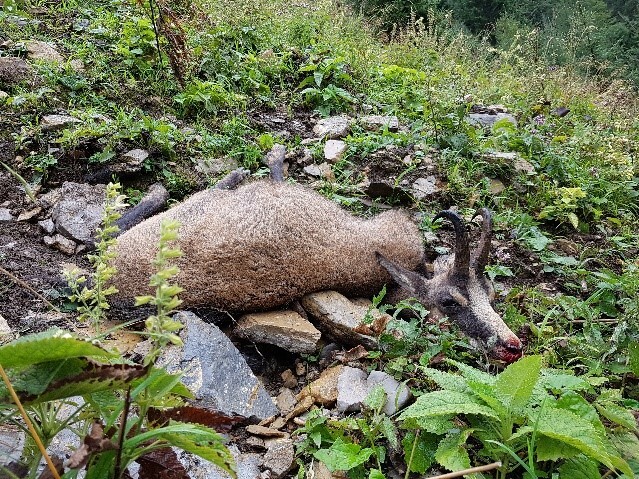 Satisfied, we cautiously descended the mountain again with our gams and met with my colleague and his professional hunter in the guesthouse, who had seen this time again chamois but was not suitable. In the evening we had a last seat where we saw red deer incl. 12 deer and chamois but did not get shot. Since my colleague had already shot more than 50 chamois, he was only special on very old geisen or 100 + CIC chamois, which we were not allowed to see in the 2 days except for the one old Geis. The chamois stock is very good, so we saw chamois or red deer almost every time we stalked, but for the even more targeted hunt for strong trophies, the rutting season is better than at the end of August. 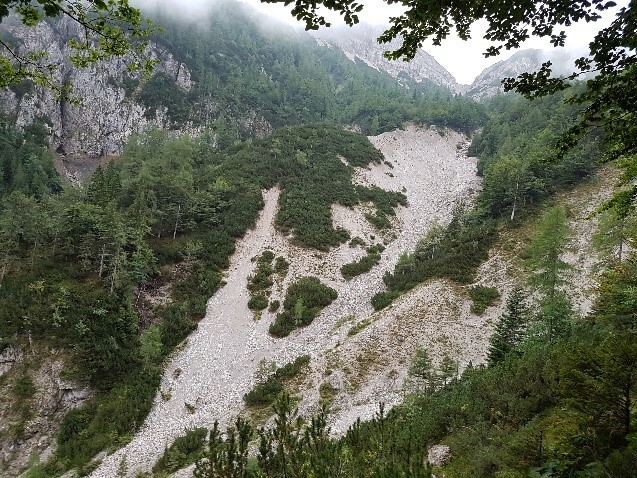 Our hunt took place here in a hunting ground in which forest gurns are mainly hunted, but Slovenia also offers areas that allow more high alpine hunts, so that different areas can be chosen as desired. 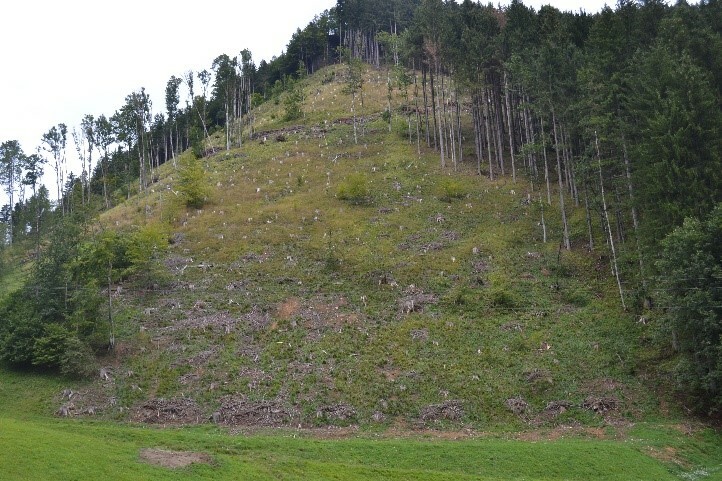 If you want a good and very safe hunt for a reasonable price, Slovenia certainly offers the best possible Gamsland.